I found recipe number 7 in the 52 week recipe challenge on Pinterest. The photo made my mouth water! Personally, my favorite way to eat ground beef is in a hamburger but this combination of brown gravy and onions is delicious. The fact that it’s an easy recipe is a plus! I like onions. A lot of onions! That’s why you can barely see the hamburger steak beneath those beautifully caramelized onions. It’s not often I have all the ingredients for a new recipe but I had parsley and beef broth on hand from other recipes I’d made recently. A few tips about the gravy. In total, the gravy should be reduced by half. I put the patties back into the skillet before it was completely reduced so they had ample time to reheat and I wouldn’t lose all my gravy. Taste before you serve to check your spices. You probably won’t need more salt but it’s good to check. I served this dish with garlic toast and mashed potatoes for a good, hearty comfort meal. Combine ground beef, salt, pepper and garlic powder in a medium bowl. Divide meat into 6 even portions and form into patties. In a large skillet over medium heat cook patties 6-12 minutes per side until internal temperature reaches your desired doneness. When they are done to your liking, remove the steaks and add onions to the pan, cooking for 6 minutes. Add garlic and cook 1 minute. Add flour and cook 2 minutes, stirring constantly. Gradually add broth and Worcestershire sauce. Stir until smooth. Reduce to half, stirring occasionally, about 15 minutes. Return patties to skillet and heat through. To serve place hamburger steaks on plate and spoon gravy and onions over patty. sprinkle with chopped parsley. 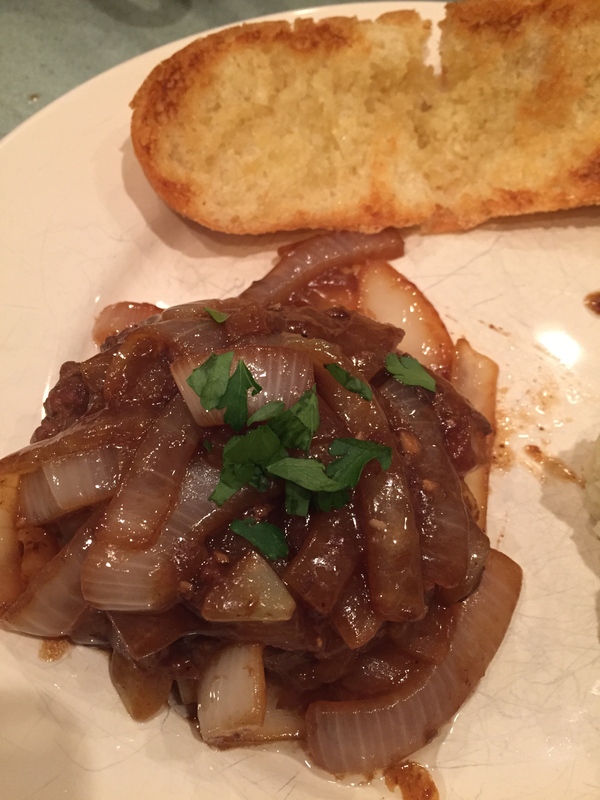 This entry was posted in 52 Week Challenge, Beef, Comfort Food, Entrees and tagged beef broth, Brown Gravy, caramelized onions, Comfort Food, dinner recipe, gravy, ground beef, hamburger, Hamburger Steak, main dish, onions, parsley. Bookmark the permalink.